From my previous blog post, you will know my love for travelling and going on holiday! I am super excited to be going to Gran Canaria in under two weeks (yaaay!). But, like many people, I am a bit of an anxious traveller, so knowing I have all my essentials in my hand luggage helps me to stay relaxed. So here are some of the things I keep in my hand luggage! What do you have in yours?! Going through passport control, using plane toilets… your hands can feel pretty gross! So, I always carry a hand sanitiser. My favourite (I’ve tried a few as a total clean freak!) 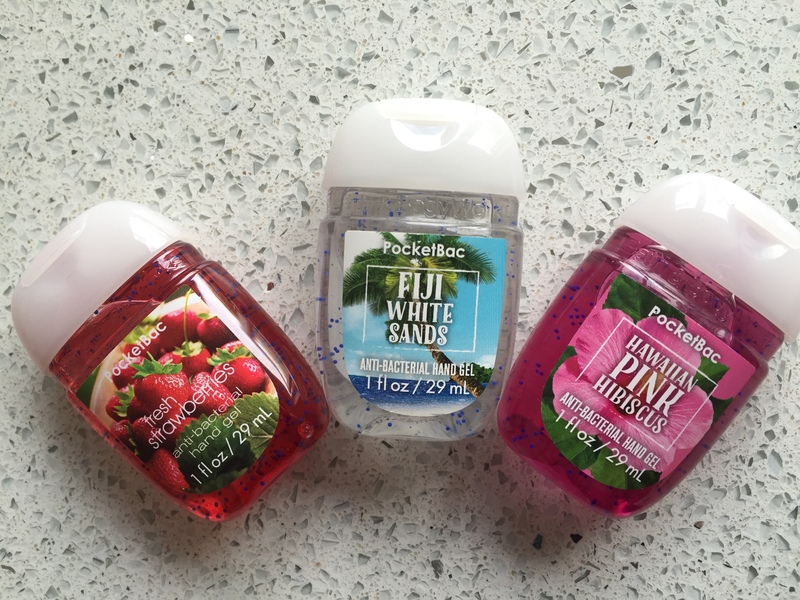 is the PocketBac hand sanitisers from Bath and Body Works which I picked up in New York, earlier this year. They come in pretty much any scent you can think of and they are the perfect compact size! I have seen online they have halloween scents(!) coming out soon, so if you’re in America this autumn, definitely check them! 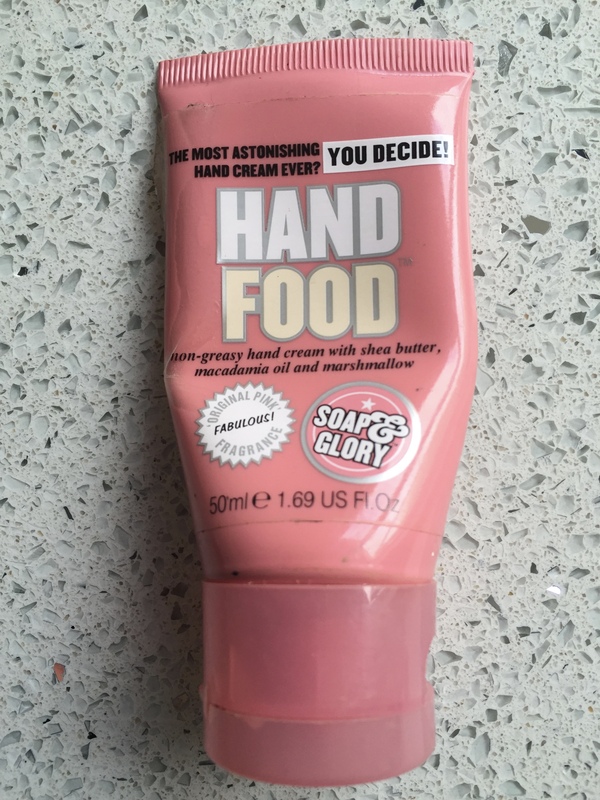 If you can’t get to America, I recommend Soap and Glory ‘Hand Maid’ which smells incredible… and it’s pink, what more could you want to keep your hands clean?! This is the ONLY hand cream you need to bring with you. It is super moisturising and hydrating on your hands which makes it perfect for flying which can dry out your skin. Also, I am OBSESSED with the scent of this hand cream! Apologies for the grubby, half empty bottle, but this has been a much loved hand luggage essential and I will definitely be repurchasing before I go to Gran Canaria! I personally don’t like taking all my make-up through security as I find it quite stressful having to squash it all into those clear plastic bags and then end up barely using any of it! So I tend to stick a few essentials such as a lip balm, lipstick, concealer and powder along with my Real Techniques powder brush (my fav). These products will help freshen up my make-up for when I arrive at my destination! If you are arriving in a hot and sunny country you don’t want to make the mistake of packing your sunglasses in your main luggage because England was pouring with rain (as per usual) and now your blinded my the sun in the 33 degree heat! They are also great if you want to hide bags under your eyes if you had to get up for an early flight! The sunnies in my main photo are from Topshop which I bought early this year. The ultimate time/killer distraction on flights. Perfect for playing a game, listening to music or watching a film… but don’t forget your headphones! These little devices are life savers for the iphones which seem to be FOREVER dying #firstworldproblems! I love the sleek design of my charger, the Anker 2nd Gen Astro 6700mAh Portable Charger (see Amazon for a current discount price!). No one wants to get off a plain with smelly breath! If I have a long haul flight I like to have a travel toothbrush with me, but for shorter flights, mints do the trick to keep your breath smelling minty fresh! And, unlike chewing gum, you don’t have the awkward moment of not knowing what to do with it as there is no bin on the plane when you’re finished! I also find sucking on a mint stops me from feeling sick so they can also be useful if you get travel sick. Next Post Hair On Holiday!